This week, Your News to Know brings you the latest stories involving gold and the overall economy. Stories include: Gold’s time to shine will be in 2018, how gold could fix Turkey’s troubled currency, and Russia and China could set global price based on trading. JP Morgan’s outlook for gold in 2018 is markedly positive, especially in the second half of the year. 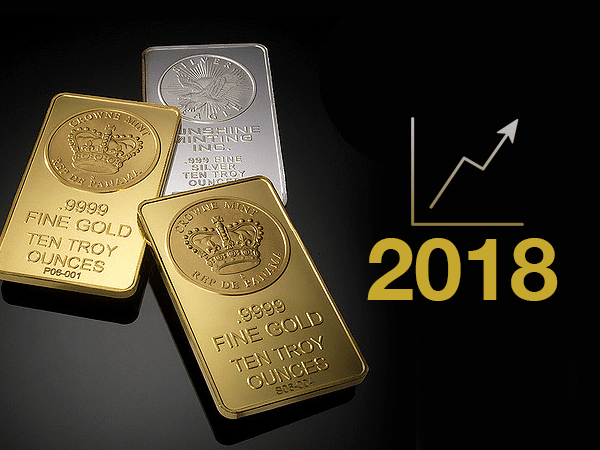 As stated in a recent Kitco article, during the first half of 2018, gold should average $1,295 an ounce, with the average climbing to $1,340 in the second half, said the bank in its 2018 Global Commodities Outlook. The pressure of additional rate hikes, which the bank expects to see five of in 2018, should bring down real rates and support all precious metals. Adding that some investors are treating a drop to $1,245 as a buy signal, the analysts also said that silver has the potential to outperform gold in the new year. “As we believe gold rallies on the back of U.S. real yields potentially stagnating in 2H18, we see even greater upside potential in silver given its historical tendency to outperform gold during outsized rallies,” they said. Predicting an average of $17.85 an ounce for silver in 2018, the bank’s analysts added that the metal will trade at $18.73 and $19.57 in the third and fourth quarters, respectively, amid a 70:1 gold-to-silver ratio. Likewise, they predict platinum and palladium to maintain prices in 2018, with platinum taking the lead towards the end of the year. Forbes’ Steve Hanke has no problem adding Turkey to the list of countries with a currency problem. In fact, Hanke believes that Turkey is a particularly severe example of a nation’s currency losing credibility, with the lira stuck plunging since 2008. Turkey’s citizens have spoken: transactions in foreign currencies comprise 70% of the deposits in Turkey’s banking system, and the public places little faith in President Erdogan’s chosen means of exchange. And with the country’s foreign reserves dwindling, it’s clear that something needs to change. While the change might need to be drastic, Hanke believes it could revolve around the application of a familiar tool: the gold standard. Having long been synonymous with money, gold was abandoned in recent decades by the official monetary system. Many agree that this led to looser economies with more baseless spending, and calls for a return to gold tethering continue to be heard. Hanke proposes to attach the lira to gold via a gold-based currency board, a method that has been utilized by over 70 countries with positive results. Ideally, the proposed board would function independently from the government, with headquarters in Switzerland assuring operations in accordance with its laws. Any notes or coins that the currency board produces, says Hanke, would have to be fully backed by physical gold stored in a secure location. And with complete convertibility between notes and bullion, Turkey could finally have access to an acceptable currency with all the stability of an established foreign note. Although New York and London are firmly positioned to dictate the price of gold, recent trends in bullion trading could provide a shake-up to the status quo. As seen on Newsmax, Russia and China could set the global price of gold based on physical trading. The trading in question occurs between China, India, Brazil and South Africa, also known as “BRICS”, are the emerging economies which account for a major share in physical gold consumption. Sergey Shevtsov, deputy chairman of Russia’s central bank, said that Russia’s and China’s central banks discussed gold trading during a recent meeting, acknowledging BRICS’ importance in production and consumption. One critique of the traditional way is that both the New York COMEX and London Over-the-Counter pricing is detached from physical gold. Due to the long-established favoring of bullion by the two countries, it’s likely that physical gold would play a significant role in prices set by Russia and China. The channel also said that shifting who sets the price of gold would call for less dependence on a reserve currency like the U.S. dollar, which is prone to debasement during trouble. Russia’s central bank has been on a quest to strengthen its gold reserves as a means of protection from geopolitical risks. As of November, the country had 1,801 tons of gold, a sixfold increase over the 343 tons at the start of Putin’s presidency.